Britannica Library is actually an amalgamation of three reference resources, offering research materials through three levels of access: Children, Young Adults, and Reference Center (for adults). Content includes three encyclopedias (one of which is the Encyclopædia Britannica), new and continually updated journal articles, primary-source material, multimedia (90,000 images, videos, and audio clips), links to 129,000 expert websites, and ebooks. The Merriam-Webster Dictionary in English/Spanish is omnipresent here (double-click any word for the definition to pop up), and audio pronunciations are also available. 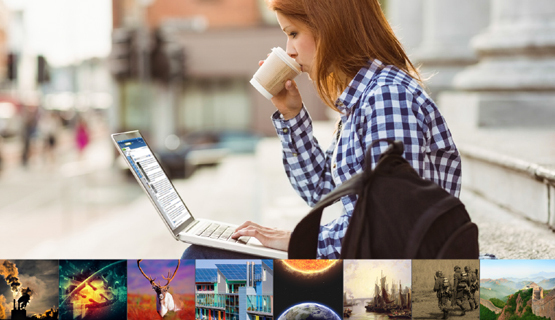 There is also access to a world atlas; a “Compare Countries” tool for statistical comparisons; “How-To” documents guiding students through creating book reviews, presentations, research papers, and science reports; the “My Britannica” personal account feature for saving and sharing articles, images, and videos; and a read-aloud feature that will enable early readers to follow along. The Library is designed for use on a wide variety of devices, including smartphones, tablets, laptops, and desktop workstations; the system self-adjusts to fit the screen ­being used. Cheryl LaGuardia is a Research Librarian, Widener Library, Harvard University, Cambridge, MA, and Bonnie J.M. Swoger is the Science and Technology Librarian, SUNY Geneseo’s Milne Library. This article was published in Library Journal.